Members should have received an eVite in their email last week. Please bring a potluck item to share for lunch, and note in the comments of the eVite what you are bringing. Also, don't forget your supplies for whatever project you are working on (plus extension cords, etc). The QuiltCon top will be at the meeting. Ooooh. Aaaah. You want to see this thing. Seriously. Feel free to drop by just for the meeting if you can't stay all day! We have four more copies of Sherri Lynn Wood's book - if you'd like to buy a copy to support the Guild, they are $20 each. Surely someone you know would LOVE to get a copy for Christmas! You will also have a chance to win some wonderful prizes! Guys! PRIZES! Thank you to every one who came out to the November meeting! We welcomed two new members, Hannah and Angela. Please take a moment to say hello to these lovely ladies at the next meeting! We also met two new friends, Susan and Nikki, who we hope we will be seeing more of in the future! The creation of two new leadership positions: Vice President of Membership and Vice President of Programs. You can review the current By-Law document here and the proposed changes here. We will be voting on this Dec. 6th at 1:00pm. You must be present to vote. Please contact the guild if you have further questions or suggestions. New officer nominations will be held in December with voting occurring at the General Meeting in January. Please review the responsibilities of each position in the proposed By-Law document linked above and consider if you may want to run this year! Pam has graciously agreed to act as Elections Official. She will be taking names for nominations. You may nominate yourself or another member (we will confirm that the other person is interested in running though!). Mona has put together a thank you card for Mrs. Paul, the lady who generously donated all that fabric to the guild in the Spring. The quilt and card will be sent out to her soon. Melissa read a thank you card from Sherri Lynn Wood to the attendees regarding the recent workshop. We are still selling tickets for the raffle quilt. The quilt is being moved to Spool this month and the winner will be chosen at random on Dec. 6th. Tickets are $1 each or 6 for $5. The QuiltCon challenge quilt blocks were collected at the meeting. There are still a few that need to be turned in, so let's get those done! 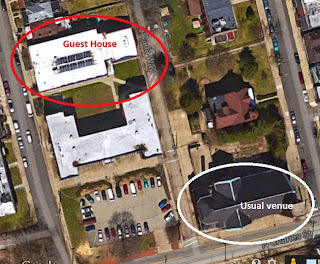 The next meeting will be an all day sewathon (exact hours to be posted soon) held in the Guest House of the Pittsburgh Project. The official meeting announcement will be up soon! There was some awesome stuff displayed at show and tell this month! Mona displaying her finished project from the Sherri Lynn Wood workshop and the first quilt she ever made! New member, Hannah's, super fun quilt top! Please check out the guild's Flickr page for all the photos from the meeting! Melissa taught a great skillbuilder detailing the ins and outs of machine quilting after the business meeting . She demonstrated the use of both the walking foot and the free motion foot. There were a lot of good tips on logistics of getting that quilting done, and she had a lot of helpful doodles detailing different quilting motifs that can be used. We also discussed a lot of the products on the market that can help with FMQ. After the discussion she let a few people try out her machine and give it a go. Hannah hard at work. Such focus. Determination. You can do iiiitttttt! Michele, lookin' like a pro! Mona's practice on her name! Keep it up, lady! Whew, that was a lot of stuff. I need a nap just thinking back on it all. Stay tuned for December meeting deets!